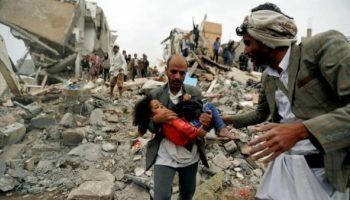 (ANTIWAR.COM) — Earlier this week, Defense Secretary James Mattis called for an immediate ceasefire in Yemen. In the course of this, he demanded an end to fighting, and an immediate halt to all airstrikes against populated areas. Friday in Yemen was much like any other, with Saudi warplanes pounding areas in and around the northern cities of Hodeidah and Sanaa. Heavy airstrikes were reported particularly around Sanaa Airport, which is definitely a civilian-populated area. Sanaa was mostly hit with airstrikes, while locals reported heavy clashes around Hodeidah, a vital port city that Saudi forces have been massing around all week. In no case is there any indication that a ceasefire is starting. Saudi and UAE officials have yet to comment on the US call for a ceasefire and peace talks at all. The only response at all from their camp was from Yemeni officials backed by the Saudis, who embraced the idea of peace talks, but similarly showed no signs of stopping fighting in the meantime.